Safety light curtains in our new F3SG-R range combine torsion-resistant construction to guarantee easy alignment with a novel troubleshooting function based on QR codes. 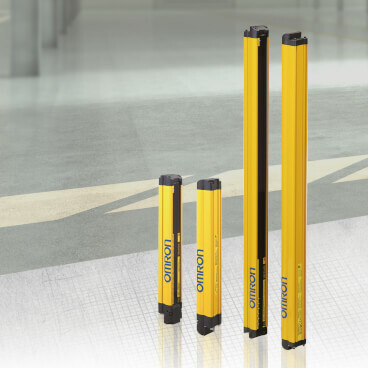 To suit the needs of widest possible range of users, the new light curtains are available in two versions, the easy F3SG-RE for simple on/off detection applications and the advanced F3SG-RA for more versatile safety solutions. The easy F3SG-RE versions, which, like the advanced F3SG-RA, have pre-wired connectors to reduce wiring time and clear LED on/off indicators, offer a dependable and cost-effective solution for simple applications. To satisfy additional requirements, the advanced F3SG-RA versions can be cascaded up to three sets and offers a wide range of additional features. These include a choice of versatile muting modes, floating and fixed blanking, reduced resolution, and a pre-reset function that prevents a machine being restarted while a worker is still inside a manufacturing cell. Both versions can be supplied as finger detection types with a detection capability of 14 mm or as hand detection types with a detection capability of 30 mm. Protective heights up to 2080 mm are offered for finger detection types, which have a maximum range of 10 m, and up to 2510 mm for hand detection types, which have a maximum range of 20 m.
F3SG-R light curtains have an IP67 ingress protection rating and are built to withstand washdown and dusty environments. They feature exceptionally rigid construction that eliminates problems of top-to-bottom twisting and makes setting up fast and straightforward. As a further aid to setting up, they incorporate optical synchronisation, which makes it unnecessary to use wiring between the emitter and detector. 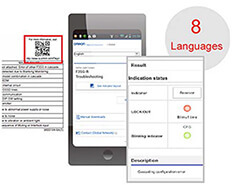 Should problems ever occur with these innovative products, users simply scan a QR code sticker that can be applied to the machine with a smart phone or tablet, and they are taken direct to a web page that provides detailed troubleshooting guidance. This information is available in eight languages. The F3SG-R range of safety light curtains also use Smartclick M12 connectors that require only one-eighth of a turn to lock them in place and provide a reliable IP67-rated connection without the need for torque measurements. All versions and models in the F3SG-R range are supplied as standard with special mounting brackets that allow easy adjustment even after installation is complete. Optional accessories include an easily attached cover that provides enhanced protection for the optical surface against scratches and mechanical impact.